Memoirs of Hadrian (French: Mémoires d'Hadrien) is a novel by the Belgian-born French writer Marguerite Yourcenar about the life and death of Roman Emperor Hadrian. First published in France in French in 1951 as Mémoires d'Hadrien, the book was an immediate success, meeting with enormous critical acclaim. Although the historical Hadrian wrote an autobiography, it has been lost. The book takes the form of a letter to Hadrian's cousin and eventual successor "Mark" (Marcus Aurelius). The emperor meditates on military triumphs, love of poetry and music, philosophy, and his passion for his lover Antinous, all in a manner similar to Gustave Flaubert's "melancholy of the antique world." Yourcenar noted in her postscript "Carnet de note" to the original edition, quoting Flaubert, that she had chosen Hadrian as the subject of the novel in part because he had lived at a time when the Roman gods were no longer believed in, but Christianity was not yet established. This intrigued her for what she saw as parallels to her own post-war European world. Yourcenar first thought of the idea for the book between 1924 and 1929. She then worked on various drafts intermittently between 1934 and 1937. The notion of writing the book from the point of view of a dying Hadrian occurred to her after reading a sentence in a draft from 1937 stating: "I begin to discern the profile of my death." She did not resume work on the book in earnest until December 1948. She states that while she based her account of Hadrian on the two most principal sources, Historia Augusta and Cassius Dio's Historia Romana, her goal was to reinterpret the past but also strive for historical authenticity. The novel is told in the first person by Hadrian and is framed as a letter to Marcus Aurelius in the first chapter, Animula Vagula Blandula. The other chapters form a loose chronological narrative which he often breaks with various insights and recollections. The story begins with Hadrian, who is around sixty years of age, describing his incurable illness. He therefore wishes to recount important events in his life before his death. His earliest memories are his boyhood years in Italica. He also talks of his early interest in astrology and his lifelong passion for the arts, culture, and philosophy of Greece; themes which he revisits throughout the book. He visits Athens to study, travels to Rome for the first time, and witnesses the accession of Trajan. He eventually joins the army and participates in the Dacian campaign. Hadrian, who is around thirty years old at the end of the war, describes his successes in the army and his relationship with Trajan who is initially cold towards him. He slowly gains Trajan's favor and secures his position for the throne with the help of Plotina, the emperor's wife, and also by marrying Sabina, Trajan's grandniece. During his military service, the outcome of the Sarmatian wars strongly affects him due to the appalling bloodshed and atrocities committed. He also begins to question the value of Trajan's policy of military expansion. Trajan, in old age, begins an unsuccessful military campaign in Parthia after his successes over Dacia and Sarmatia. After a major defeat, Trajan hastily names Hadrian as his successor in a will shortly before his death. Following the death of Trajan, he hesitantly has his rivals executed and makes peace with Parthia. He travels frequently throughout the provinces of the Roman Empire while undertaking numerous economic and military reforms, promoting in his words: “humanitas, libertas, felicitas.” During a visit to Britain, he describes the construction of Hadrian's Wall, which represents part of his vision of curbing the military expansion of his predecessor and promoting peace. Hadrian's administration is a time of peace and happiness which he regards as his "Age of Gold." He attributes this happiness to his love for Antinous, a beautiful Bithynian youth he meets in Nicomedia. He also feels genuinely loved by Antinous compared to the fleeting passions of his youth and the loveless relationship with his wife Sabina. While visiting Egypt, he despairs over the sudden and mysterious death of Antinous who drowns in the Nile. He ultimately believes that Antinous sacrificed himself in order to alter the outcome of troubling portents that both had witnessed earlier. In his grief, he devises the cult of Antinous and makes future plans to dedicate a new city to him in an effort to eternalize his memory. Hadrian begins reflecting upon his advancing age and his change in temperament, recalling one incident where he accidentally blinds his secretary out of rage. Further troubling him is the outbreak of rebellion in Judea, which forces him to travel and take command of the troops. During an important siege, he despairs over the unraveling of his plans for peace, his ailing heart condition, and later over the rampant destruction in Judea. He states, "Natura deficit, fortuna mutatur, deus omnia cernit. Nature fails us, fortune changes, a god beholds all things from on high…"
During his final years in Rome and at his villa in Tibur, he ponders his succession and his thoughts turn to a memory of Marcus Aurelius as a virtuous and kind-hearted boy. Hadrian, now in advanced age and very poor health, begins to fear death and contemplates suicide through various means. He finally accepts his fate with resignation, or patientia, while reflecting on his newfound divine status throughout the Empire. Near death, he contemplates what the future may hold for the world, Rome, and for his soul. "My hunger for power was like the craving for love, which keeps the lover from eating or sleeping, from thinking or even from loving as long as certain rites remain unperformed. The most urgent tasks seemed vain when I was not the free master over decisions affecting the future; I needed to be assured of reigning in order to recapture the desire to serve." "Of all our games, love's play is the only one which threatens to unsettle our soul, and is also the only one in which the player has to abandon himself to the body's ecstasy. …Nailed to the beloved body like a slave to a cross, I have learned some secrets of life which are now dimmed in my memory by the operation of that same law which ordained that the convalescent, once cured, ceases to understand the mysterious truths laid bare by illness, and that the prisoner, set free, forgets his torture, or the conqueror, his triumph passed, forgets his glory." "Like everyone else I have at my disposal only three means of evaluating human existence: the study of self, which is the most difficult and most dangerous method, but also the most fruitful; the observation of our fellowmen, who usually arrange to hide secrets where none exist; and books, with the particular errors of perspective to which they inevitably give rise." ^ Yourcenar. Memoirs of Hadrian. English Edition. 2005. p. 319-320. ^ Yourcenar. Reflections on the Composition of Memoirs of Hadrian in Memoirs of Hadrian. English Edition. 2005. p. 319-320. ^ Yourcenar. 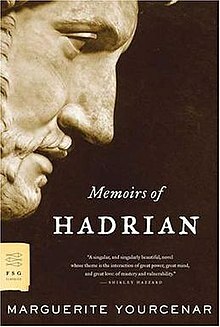 Reflections on the Composition of Memoirs of Hadrian in Memoirs of Hadrian. English Edition. 2005. p. 326, 329. ^ Yourcenar. Memoirs. 2005. p. 243. ^ Yourcenar. Memoirs. 2005. p. 86. ^ Yourcenar. Memoirs. 2005. p. 12-14. ^ Yourcenar. Memoirs. 2005. p. 21. Acocella, Joan (14 February 2005). "Becoming the Emperor". The New Yorker. Retrieved 15 June 2016. Epstein, Joseph (9 October 2010). "Portrait of Power Embodied in a Roman Emperor". Wall Street Journal. Retrieved 15 June 2016. This page was last edited on 3 October 2018, at 09:40 (UTC).